The Trimble Farmer's Market rolls on, but winter is on the way and nothing goes better with cool weather than hot apple pie and fresh cider. Stop by tonight and enjoy the harvest of Brad Smith, our Trimble Farmer's Market Vendor of the Week! Starting, as many stories do, with grandfathers, Brad's grandpa was an accomplished grower by any measure, caring for a grove of over 1,000 trees at his orchard's peak. With 700 apple trees and 300 peach, Brad's family never had to go very far to get their fill. As a senior in high school, Brad worked with his own father to restore the aging fields by starting a new grove on the same ancestral earth with 50 apple trees and a lot of hard work. 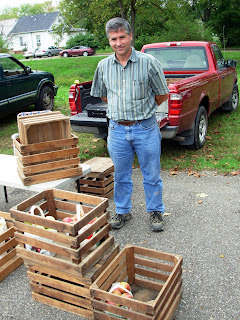 Brad celebrated his first harvest of this new orchard in 2006 and shares the bounty with local folks at the Trimble Farmer's Market. You might notice the crates in the picture getting a little empty, well that's only because we made the mistake of getting there late and he was nearly sold out! "Business has been good" Brad remarks. And about that home pressed cider? "Get here early" he warns "that stuff goes quick." So if you don't want to miss out on some of the best apples and cider of 2009 then don't forget to stop on by the Trimble Farmer's Market tonight! Open every Friday from 4-6pm just across the street from Trimble Kroger. Great produce, great prices, and great people, see you there!